NEW YORK — Filip Chytil scored the tiebreaking goal 4:32 into the third period to rally the New York Rangers to a 2-1 win over the Dallas Stars on Monday night. Chytil put the Ranges ahead with a snap shot from the top of the left circle. Before shooting, he cut behind Stars defenseman Joel Hanley, in effect using him as a screen. The teams went into the second intermission tied 1-1 after 40 minutes in which New York held a slight 13-12 advantage in shots. Vesey tied it with his seventh 7:21 later as he twisted his body around Stars defenseman Roman Polak before backhanding a loose puck past Bishop while falling to the ice. Lundqvist kept the game even, and equaled Bishop's flashy pad stop on Howden by making a spectacular glove save on Stars rookie defenseman Miro Heiskanen's shot from the slot with 1:05 left in the second. NOTES: One day after being called up, RW Steven Fogarty dressed and played on New York's fourth line. The game was his first of the season, and his second career NHL game. In 19 games with AHL Hartford this season, Fogarty had seven goals and seven assists. ... New York D Brady Skjei was scratched for the second straight game. 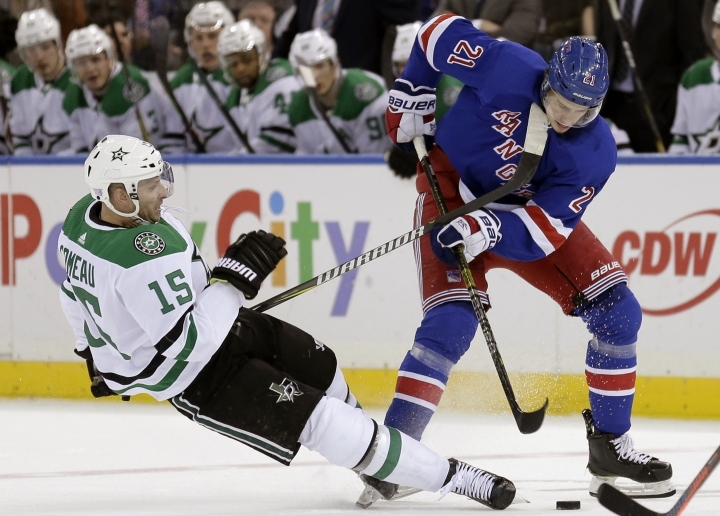 ... Rangers RW Mats Zuccarello missed his second straight due to an undisclosed injury. ... During his pregame availability, first year Dallas coach Jim Montgomery acknowledged he had discussions with New York about its coaching vacancy after the Rangers fired Alain Vigneault. "We did have some conversations," Montgomery said. "(Dallas GM) Jim Nill (was) very aggressive in his pursuit of me, and the lifestyle in Dallas was a lot more similar for my family to Denver." Prior to being hired by the Stars on May 4, Montgomery was the coach at the University of Denver for five seasons where he compiled a 125-57-26 record and won the national championship in 2017. New York eventually hired David Quinn from Boston University on May 13. ... Dallas scratched D Ben Gleason, RW Brett Ritchie and C Devin Shore. ... The teams will meet once more this season, March 5 in Dallas. ... New York Knicks G/F Tim Hardaway Jr. was among the announced 17,071 in attendance.